Cha-cha-cha-CHIA! Yes, that’s what we think of when we say chia. Those funny terra cotta heads sprouting green hair… until now! 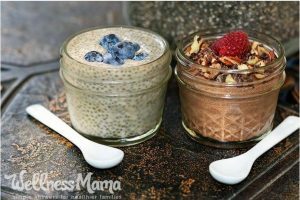 Chia seeds are everywhere these days and sweeping the nation as an up-and-coming nutritional ingredient and super food. Chock full of fiber and omega-3’s, these little seeds can be added to juices, baked into muffins or even toasted and sprinkled on your salad. Soaked in liquid they get a gel-like coating. Endurance athletes love them in beverages for their super hydrating power. I have also used them plumped then blended in a low fat dressing – they work as a natural thickener so you can use less oil, and who doesn’t love that? My current favorite is to make a breakfast chia pudding! Assemble the night before with chia seeds, gluten-free oats, coconut milk, and a touch of honey. Let it sit overnight in the refrigerator while the plumping begins. 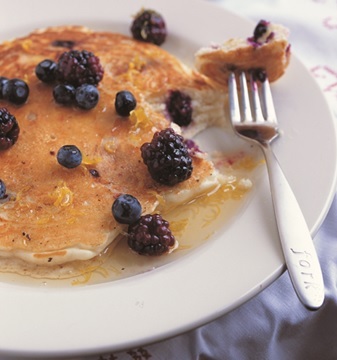 The next morning, you can top it with fresh fruits – yum! I love this photo and the recipes from Wellness Mama – She has a great blog on Chia! Ahh blackberries… the glorious summer berry growing in backyards, parks, and all along our northwest trails. These delicious juicy little fruits are definitely worth the fight with the prickly bushes that they grow on – and your patience will be rewarded! Not only are blackberries delicious, but they’re good for you! With one of the highest levels of antioxidants of any fruit – these berries are also a wonderful source of vitamins C and K as well as fiber. Truth be told, I think blackberries really are a taste of summer, which is why they’re the perfect addition to a refreshing summer cocktail. Add them into a shaker tin with some fresh mint, lime juice, simple syrup and rum, and you have a wonderful (and easy to make) Blackberry Mojito! Gone blackberry picking and now have a big bowl in the fridge? Throw some in your pancake batter and start the morning off with some d’lish Blackberry Pancakes topped with Citrusy Syrup. Or how about a summer salad tossed with Blackberry Honey Vinaigrette – a sprinkling of toasted hazelnuts and fresh goat cheese – a great start to any summer meal. Toss with summer garden greens, and fat blackberries. Scatter with toasted hazelnuts and a crumbling of blue cheese or chevre. Dressing recipe can easily be doubled. Makes about 1 generous cup of dressing. Combine all the vinaigrette ingredients in a blender or food processor and process until smooth. Refrigerate until needed. Can be made up to 3 days in advance. Labor Day is coming up – a holiday that commemorates the workers who have helped make this country great. To many, it also heralds the end of summer and the last 3-day weekend before school starts. So why not enjoy the last blast of summer with a great picnic potluck among friends and family? Try twisting up your menu with some new drinks and dishes too. Start out with a refreshing drink such as a house-made sparkling blackberry lemon soda – perfect for using up the last of those wild picked blackberries! Serve it dry or add a splash of your favorite local vodka or gin. For the food – set out an array of apps to make a meal of it. Try giving a sassy twist to some old favorites like Sriracha Deviled Eggs, or something new in the dip department like Creamy White Bean Dip with Garlic and Rosemary topped with chopped up fresh summer tomatoes and served up with fresh cucumbers, and grilled pita for dipping. 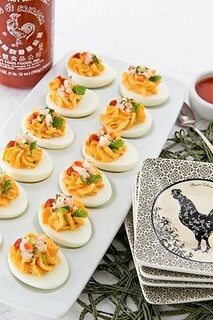 Sriracha Deviled Eggs – Yum! Sriracha adds a spicy kick and a beautiful color to these festive eggs. The shrimp and cucumber topping adds a fresh note and fun texture. Be sure to use eggs that are at least 10 days old or the shells will not peel off easily. With a fork, mash the yolks to a smooth consistency. Add the mayonnaise, Sriracha and salt, and mix until smooth (you can also do this in a mixing bowl with a whip attachment). Stir in the green onion and celery. Spoon the mixture into a pastry bag fitted with a plain or large star tip, then pipe the mixture evenly into the egg white halves or fill the eggs with a spoon, dividing the filling evenly. To make the topping, stir the vinegar and sugar together in a small bowl, until dissolved. Add the shrimp, cucumber, pepper and cilantro, and toss until well coated. Top each egg half with about one heaping teaspoon of the mixture. For extra flavor and spice top each egg with a dot of Sriracha and garnish with a tiny cilantro leaf, if desired. Serve immediately. I like to serve this dip with crostini, grilled flat breads or fresh veggies, such as pieces of fennel, red peppers, blanched green beans or grilled vegetables. For a variation, top with diced fresh tomatoes, cucumber and your favorite olives. Drain beans well, then combine in a food processor with the garlic cloves. Process for about 1 minute, then scrape down sides of food processor work bowl, and add the chili flakes, lemon juice and zest, rosemary and salt. With motor running, add the olive oil through the feed tube in a slow stream. Process until smooth. Taste for salt and adjust if desired. This dip will keep refrigerated for up to 3 days. Serve in a bowl; drizzle dip with a tiny bit of olive oil and garnish with a fresh rosemary sprig if desired.